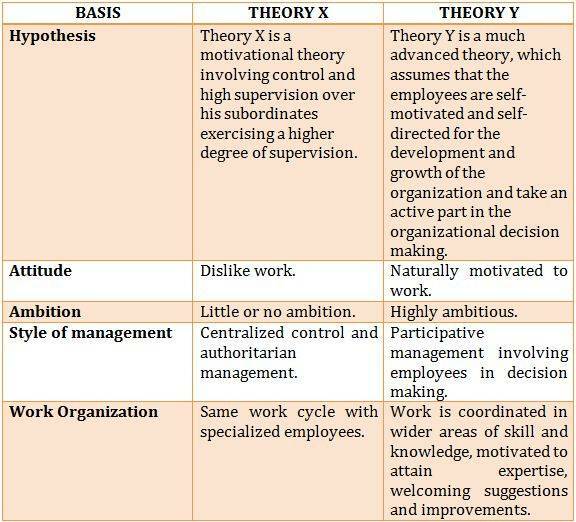 Theory X and Theory Y are employee motivation theories formulated by Douglas McGregor at MIT Sloan School of Management in 1960, which is used in the organisational development and organisational behaviour. McGregorvitalises divides management patterns into Theory X and Theory Y. He clearly explains the two contrasting attitudes towards employee motivation. McGregor proposes that Theory X is organisation theory and Theory Y is a positive theory of management. Your style of management has a strong influence on your assumptions and beliefs concerning the key motivators that encourage your employees. If your system supports an organisation that your team members are lethargic and not motivated, you are inclined towards an authoritarian style of management, while if your belief system assumes that employees are highly motivated and take pride in doing a great job, you adopt a participative style of management. Theory X is a “We versus They” approach. Theory X assumes that the employees have little or no ambition, avoid responsibility, are individual goal oriented and innately lethargic, unmotivated and disrelish working, which is why this theory insists the management to intervene to get jobs done. It focuses on a comprehensive and a closely supervised system of control since the employees are not naturally motivated. Requires force, control, and warnings to deliver what’s needed. Efficient employee management necessitates a hierarchical structure with a narrow span of control at every level. The managers that are influenced by theory X believe in the blame game, where they blame employees in most situations, without looking at their policies, systems or lack of training. The end result of this is that the managers adopt a controlled management threatening punishments. Critics assume that Theory X managers could impede employee productivity and morale. According to Douglas McGregor, there are two contrasting approaches to this theory, i.e. the hard and the soft approach. The hard approach focuses on intimidation, supervision and punishments, which potentially creates an unfriendly, minimal cooperative workforce and creates bitterness towards the management. The soft approach is more lenient aiming to foster cooperative employees and developing high workplace morale. Theory Y assumes that employees are naturally motivated, love their jobs, and work towards development without rewards or returns. The managers believe their employees are the utmost valuable assets, managing the internal working of the organisation. The managers are very optimistic, are positive of their subordinates, and employ a participative, decentralised style of management, which vitalizes and motivates a trust-based and a collaborative senior-subordinate relationship. Managers encourage the subordinates for suggestions and motivate skill development. This theory assumes that the employees willingly take up additional responsibility and don’t need close supervision. Managers relate to their subordinates on a personal level, and in turn, have a better relationship furnishing a healthier work environment. Theory Y incorporates a pseudo-democratic environment at the workplace that enables the employee to construct, design, and publish his work on time and coordinate with their workload and projects. Nevertheless, theory Y has its own limitations – a personal and a more individualistic feel, which gives a lot of room for error with respect to uniformity and consistency. The organisation lacks rules and practices that are potentially detrimental to the company guidelines and the quality standards. Few organisations employ Theory X, which stimulates the use of supervision and tight control, and assumes that employees are resistant to changes in the organisation thus suppressing innovation. A lot of organisations are using Theory Y technique, which imparts that the managers must encourage and create a work environment that furnishes opportunities to employees to take the initiative and self-direction. Employees are recognised as a part of the organisation and are given opportunities to contribute to the well-being of the organisation. It aligns and harmonises employee needs and aspirations with the organisational aspirations and needs. Theory X represents a pessimistic view of the employee’s behaviour and nature at work, while theory Y represents an optimistic view of its employee’s behaviour at work. When correlated with Maslow’s law, we can say that Theory X is based on assumptions that the employees emphasise on safety and psychological needs, while theory X is based on esteem, social, and self-actualisation needs. Douglas McGregor validates Theory Y as sustainable, rational and a sound theory of management hence encourages stimulating and responsible jobs, cordial team relations and participation of all in decision making.